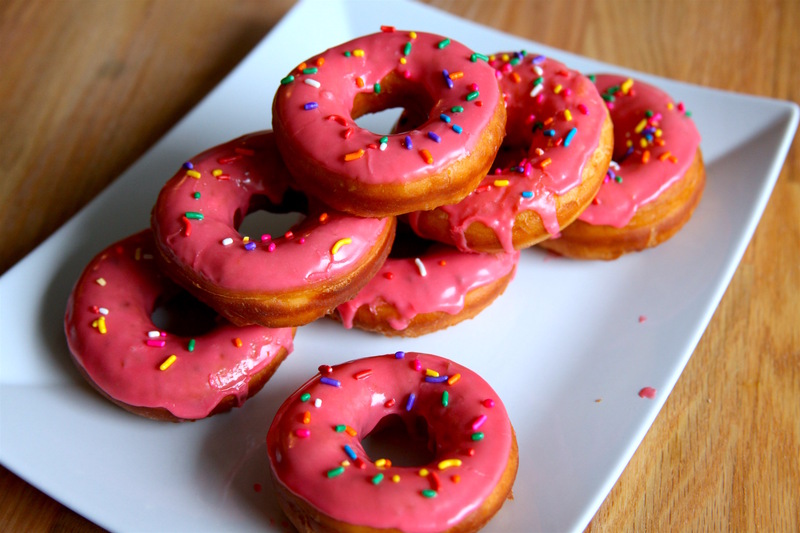 Do I even need to go on about the legend that is neon pink Simpsons Doughnuts? I don’t, but I do because SEO game strong. If you’ve never made glazed or frosted doughnuts before, making Homer Simpson’s famed D’Oh Nuts is a great start. These donuts use a double rise method to make them nice and fluffy, and are then fried and glazed with a delicious raspberry frosting. You could also make the Simpsons Doughnuts frosting with red dye, but coloring your frosting with berry juice is way more delicious. 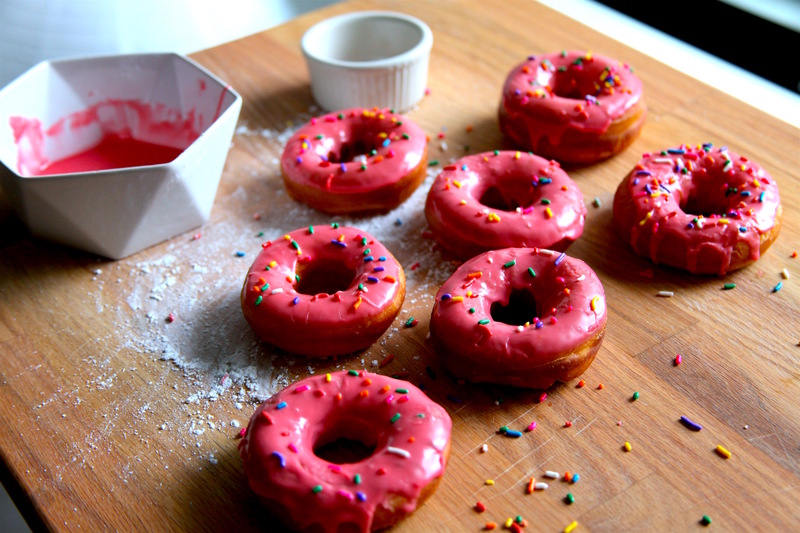 You can also bake these Simpsons doughnuts instead of frying them. 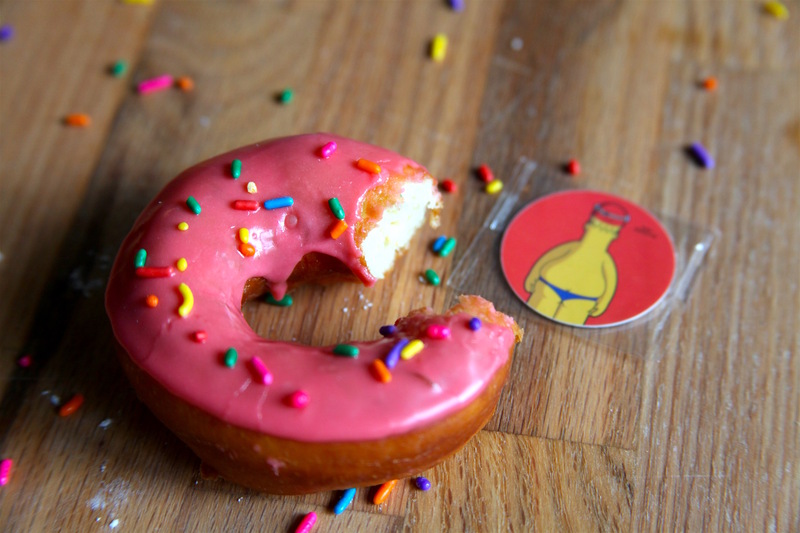 The Homer Simpson donut has a special place in the heart of any kid who grew up watching The Simpsons. 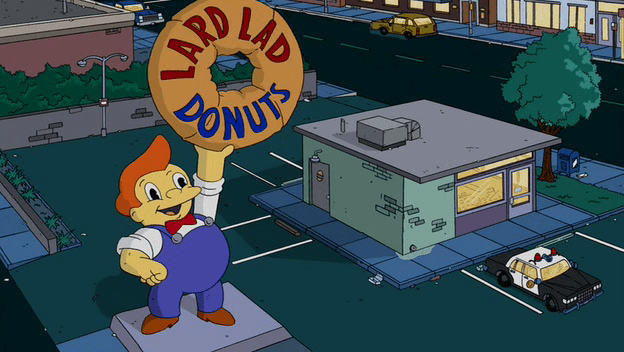 In the Simpsons universe, the doughnut originated from the Lard Lad Donuts shop, which features their portly eponymous mascot that is definitely supposed to resemble that of Bob’s Big Boy. In addition to Homer Simpson, Chief Wiggum goes nuts for these D’oh Nuts. They’re an essential part of pop culture and have been made into everything from pool floaties to pillows. Right now, the Simpsons are making a hipster comeback. Not that the Simpsons ever went out of style, but the famed series is gaining renewed popularity with the rise of musical genre Simpsonswave. Sort of like chillwave (ex. Toro y Moi) and the closely related vaporwave, the genre features purple-tinted Simpson episode clips with mashups of Simpsons dialogue. “Sunday School” by Lucien Hughes is my current jam for deep, true, obvious reasons. Now go out there and make some donuts, for her. Were you going to listen to ~*vaporwave*~ in Sunday School? Fun fact: pogs are still crazy popular in Colombia. Featured here are some of our favorite Simpsons pogs diligently collected from bags of chips over the years. Mr. Scorpio says productivity is up 2%, and it’s all because of my motivational techniques, like donuts and the possibility of more donuts to come. 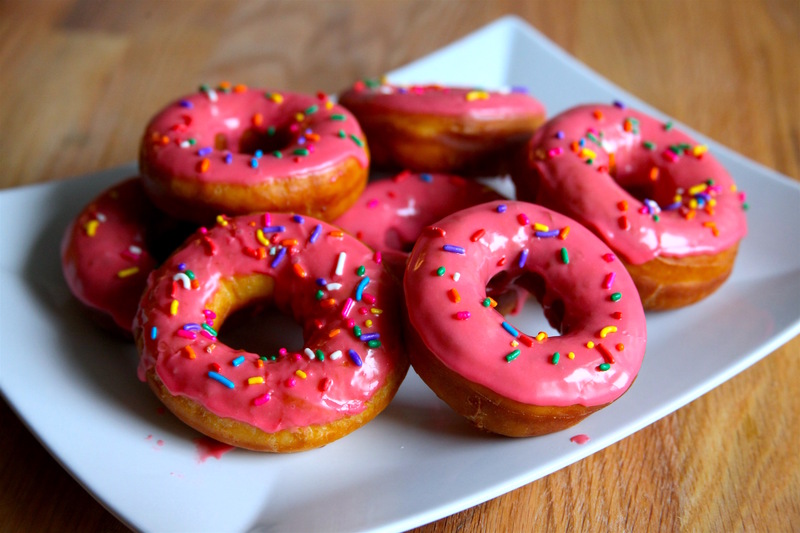 Make this raspberry frosting glazed Simpsons doughnuts recipe. Eat like Homer Simpson with these classic D’Oh Nuts which have been deep fried and frosted! Prep batter. In a small saucepan, heat the milk until warm (90 degrees). Remove from heat and stir in yeast. Let mixture sit for 5 minutes or until foamy. Attach dough hook to stand mixer. In stand mixer bowl, beat together eggs, butter, sugar, salt and yeast mixture. Once consistent, add 1 cup of the flour and beat until combined. Slowly add the rest of the flour until dough pulls away from sides of bowl, adding more flour if necessary. Return dough to a floured surface, and using a rolling pin roll it out to 1/2 – 1 inch thickness. Using a cookie cutter or floured plating ring, cut out circles from the dough (3-4 inches). Using a smaller cutter or shot glass, cut holes in the middle of the circles, reserving dough holes for later frying. Place cut dough and holes on a floured baking sheet and cover. Heat oven to 200 degrees F, turn off the heat, and place baking sheet in over with the door open. Let dough and holes rise again for about 45 minutes. Fry doughnuts. In a heavy bottomed skillet, slowly heat oil up to 375 degrees F. Separately line a new baking sheet or plate with paper towels. Add 1-2 doughnuts to the oil without overcrowding the skillet, using a spatula or carefully with your hands. Fry for 30-45 seconds, or until bottom is a deep golden brown. Flip doughnuts over using a metal spatula and fry again for another 30-45 seconds. Remove doughnuts and place on paper towel lined sheet or plate. Repeat with doughnut holes. Make frosting / raspberry glaze. While doughnuts cool, press berries through a mesh sieve to collect juice. In a small mixing bowl, beat together milk, powdered sugar and berry juice. Add red food coloring as preferred. Assembly doughnuts. Dip the tops of doughnuts in frosting / raspberry glaze and allow to drip straight over the bought for 10 seconds. Flip Simpsons doughnuts over and sprinkle rainbows sprinkles on top. 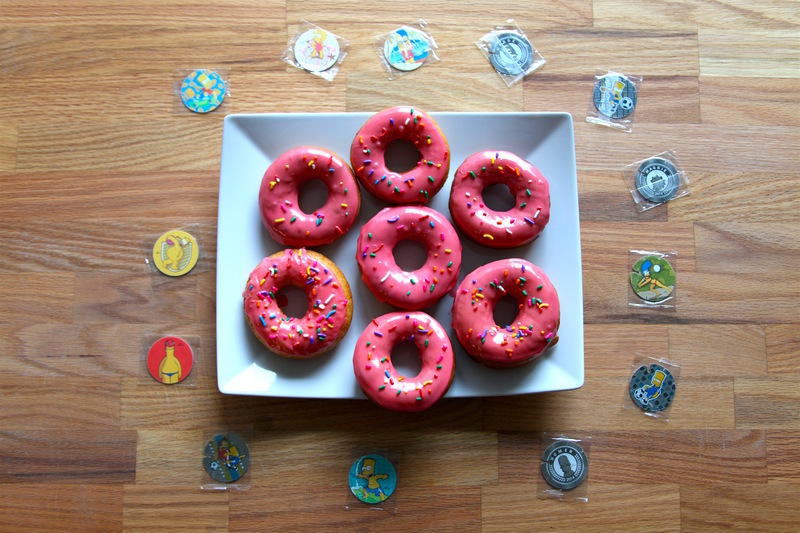 Made Homer Simpson Doughnuts at home? Tag your Simpsons Donut photos with #PateSmith or share them in the comments for the chance to be featured onsite!